- Sunday's episode of WWE's Total Bellas on E! drew 726,000 viewers and ranked #16 for the night on cable in the 18-49 demographic. This was the mid-season finale. This is down 1% from last week's episode, which drew 734,000 viewers and ranked #18 for the night on cable, which was a new high for this season. Last week's show also drew the second-highest Total Bellas viewership in the history of the show, next to the second episode of the first season that drew 756,000 viewers. FIFA World Cup games and coverage topped the night in the 18-49 demographic and viewership with almost 14 million viewers across 4 airings on cable. 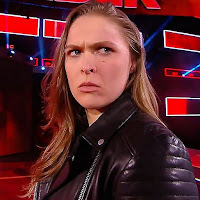 - Ronda Rousey was issued a 30-day storyline suspension on last night's episode of RAW after attacking General Manager Kurt Angle and several officials during the opening segment. Assuming the suspension went into effect immediately, that would mean her suspension would be up on Wednesday, July 18th. It's not known if the suspension was done because Rousey is not booked for a match at the Extreme Rules pay-per-view on July 15th, or due to her other outside commitments. In addition to being inducted into the UFC Hall of Fame on July 5th, her upcoming movie Mile 22 is scheduled to be released on August 3rd. However, as of this writing, Rousey has not been pulled from her scheduled WWE dates, including this Sunday's RAW live event at the Honda Center in Anaheim, CA. Over the next 30 days, Rousey is scheduled for 7 WWE shows, 3 of which are RAW tapings. As we saw with Roman Reigns' one-week storyline suspension in March, the suspension didn't count for live events, as Reigns made all of his scheduled dates during that period. As for the RAW tapings, Rousey could just work a dark segment on those shows.